Örzse Ádám graduated from the Franz Liszt Academy of Music in Budapest (György Konrád, Ferenc Rados, György Kurtág), on both, modern and baroque viola from the Indiana University-Bloomington USA, (Atar Arad, Rostislav Dubinsky, Stanley Ritchie), and as a post-graduate from the Sweelinck Conservatorium-Amsterdam (Lucy van Dael). In 2006, she received the Certificate for Concert Programming at the ArtEZ Conservatorium, Arnhem (NL). Örzse Adam is currently living in Amsterdam. She is an active performer both on the modern and baroque viola, and has been touring all over the world with chamber music groups and orchestra?s such as The Rococo Trio, Musica Ad Rhenum, Harmonie Universelle, Van Swieten Society, The Ives Ensemble, The Holland Harp Trio, The Renoir Ensemble, Tango Dorado, Nynke Laverman, The Amsterdam Baroque Orchestra, Les Musiciens du Louvre, Wiener Akademie, Le Concert Spirituel, Holland Symfonia, The Dutch Radio Chamber Orchestra, The Dutch Radio Philharmonic Orchestra, The Amsterdam Bach Soloists, The Budapest Festival Orchestra and The Hungarian Radio Orchestra. As a soloist she has been performing with Bonheur Theaterbedrijf in the project Odyssee, and on the viola d?amore with Michael Chance, Greta de Reyghere and Musica ad Rhenum. 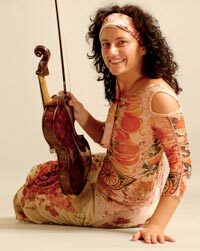 Besides her career as a performing artist, she has created and runs her own company Classic For You, and also has been the Artistic Programmer of the Holland Symfonia Chamber Music Series.